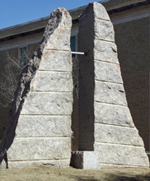 Outside the library are two stone granite guardians about 12 feet tall. They create a noon marker along a low stone wall set along the solar meridian. There are three markers rods set horizontally across the top of the wall that catch the shadow of a horizontal bar set between the two granite pillars. The shadow falls on the farthest horizontal rod on the wall at winter solstice. During the summer solstice, the shadow falls on the nearest rod to the granite block. And on the spring and fall equinox, the shadow falls on the middle rod. Within the library's atrium is a meridian line illuminated by a small gnomon hole in the roof. Near 1:33pm the public can observe the sun illuminate a solstice marker at the end of the meridian. "When the building was under construction, Baker and Austin College students worked to determine the precise locations for the markers. Precision was definitely important as the markers were permanently placed in the atrium’s terrazzo flooring. The placement has proved perfect in the seasonal events since."